I'm not a resolution guy, I don't think that a new year means a new start. I try to take every day as its own. However, during this particular 365 days, I took some images. Here are my fave images from 2017, along with a little backstory for some of them. I hope you enjoy. Here's to 2018. Here's to today. PS. If you like what you see and would like to hire me to shoot your event, your pro wrestling show, your fight camp, your portrait, etc...please contact me. I look forward to creating with you. Bellator's Michael Chandler stands on the coast of Florida, post beach workout session with Henri Hooft. UFC's Joe Benavidez in the mountains near Las Vegas, NV. Joe is always down to create images with me, and it's fun to brainstorm with him and create something unique. So continuing with Joe Benavidez always being down to create, here he is with his wife, Megan Olivi, and their dog Benny. We wanted to do an homage to the Kanye & Kim images we saw in Harpers Bazaar. A shot of UFC President Dana White, backstage at the World MMA Awards. I asked him for a quick portrait and we did this in about 30 seconds with some video lights that were there for interviews with the winners. I rattled off about five shots before I could tell he was getting over it. I was fortunate to grab this one. A face altering punch from Alliance MMA/CFFC event in San Diego, CA. The best part was immediately after this event, I got horribly sick and ruined my wife's vacation. Love you! Boxer Leo Santa Cruz enters the MGM Grand with his son for his open workout, days before his fight with Carl Frampton. A defeated Carl Frampton leaves the ring after his fight against Leo Santa Cruz. Demetrious "Mighty Mouse" Johnson just before he entered the cage to defeat Ray Borg and set the record for most consecutive title defenses. Cris Cyborg for a Bleacher Report article with Jonathan Snowden. I wanted to show Cris in a different light than how we usually see her. I was hopeful she would be open to a few things, but to my pleasant surprise, she was completely down for everything and was very excited to see how the images turned out. Herman Terrado goes airborne against Joao Zeferino. This was PFL's inaugural event, held inside Daytona International Speedway. Due to rain delay, the fights were bumped up, which turned into a crazy scene with the all the drivers and pit crew watching the action. Outside, pouring rain, under a tarp. Gotta say it was probably the most unique environment I've ever shot a fight in. It felt like a throwback to old MMA. I really dug it. 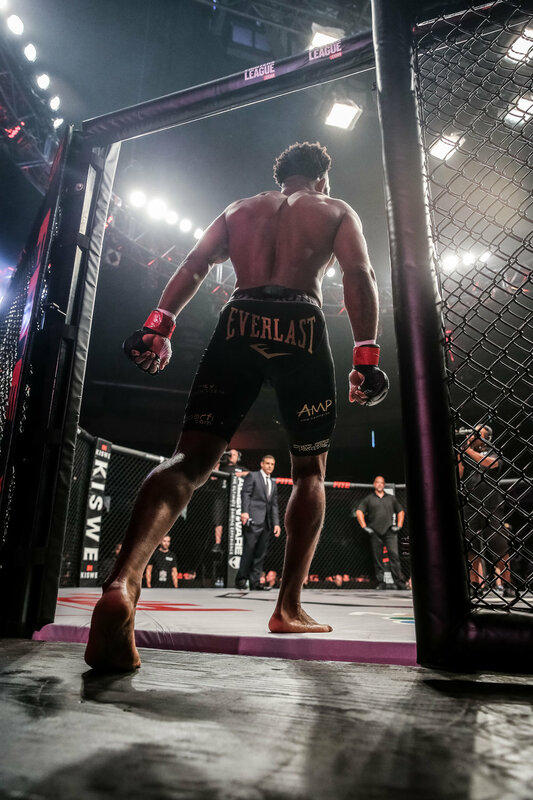 Andre Harrison entering the cage at PFL's second event in Everett, WA. Janey and Emily, the WSOF/PFL ring girls who love snacks on fight night possibly more than anything on the planet. Beach training with Luke Rockhold during his fight camp in Florida for David Branch. The entrance for Gennady Golovkin for his fight with Canelo Alvarez. I love the fans with their GGG hats, the phones recording the entrance, and how the light makes it look like he is parting a sea of fans. WWE superstar Becky Lynch, in her hotel bathroom. She was so open to all my weird ideas, including this bathtub shot. I told her I hoped it would lead to a bunch of people asking, "Why is she in a bathtub?" After being posted on social media, many of the comments were..."Why is she in a bathtub?" Success. A quiet moment for Stephen Thompson before his attempt to become the UFC welterweight champion. However, Tyron Woodley kept his belt, and gave me this shot as he left the cage victorious. Canelo Alvarez giving me the beautiful sweat flying shots we all hope to capture, as he cruised his way to a victory over Julio Cesar Chavez Jr.
MMA legend Randy Couture waits outside the PFL cage to be introduced to the Everett, WA crowd. Portrait of Harry Smith, son of legendary Davey Boy Smith, taken post match backstage at FSW Las Vegas. Michael Chandler lands a body shot to coach Henri Hooft in a Vdara hotel room. Often times on UFC fight weeks, rather than search for a gym, a hotel suite will do. Getting the text that I would be in the building for Mayweather v McGregor was probably one of the best texts I've ever received. Even just being there for weigh in would almost have been enough. It was one of those evenings where it went by so fast, it's hard to fully soak in the moment. It was still hard to believe it was happening until the opening bell rang. In the end, I think all the fans left satisfied, both fighters left handsomely rewarded, and even into 2018 we are asking, Rematch? Bodybuilder Flex Lewis training in his private gym in Boca Raton, FL. A few weeks later, he would win his sixth Mr. Olympia 212lb title. Two time Olympic gold medalist Kayla Harrison, making her MMA debut later this year. 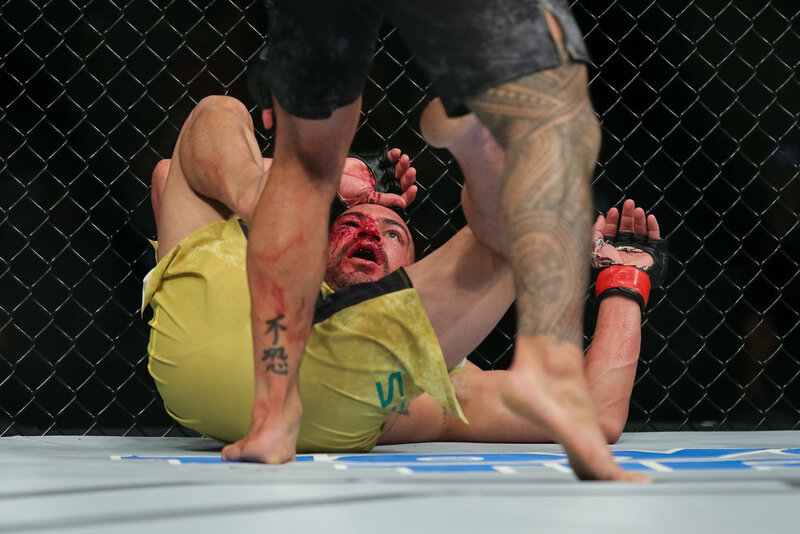 A bloodied Jim Miller dealing with the backpack that is Anthony Pettis at UFC 213. The entrances for Robert Whittaker and Yoel Romero, before their fight at UFC 213. Whittaker would go on to defeat Romero and become the interim UFC middleweight champion. Matt Riddle flies high in his match against Brian Cage in FSW Las Vegas. If you bring your dog to studio day, you better believe I am taking a photo. Mara Romero Borella secures the rear naked choke against Kalindra Faria. Thales Leites in not a good spot against Brad Tavares at UFC 216. 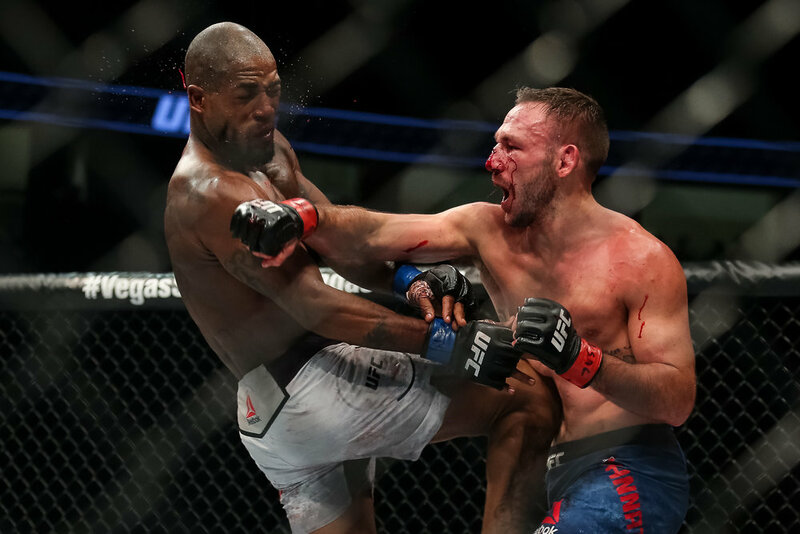 Lando Vannata lands against Bobby Green at UFC 216. 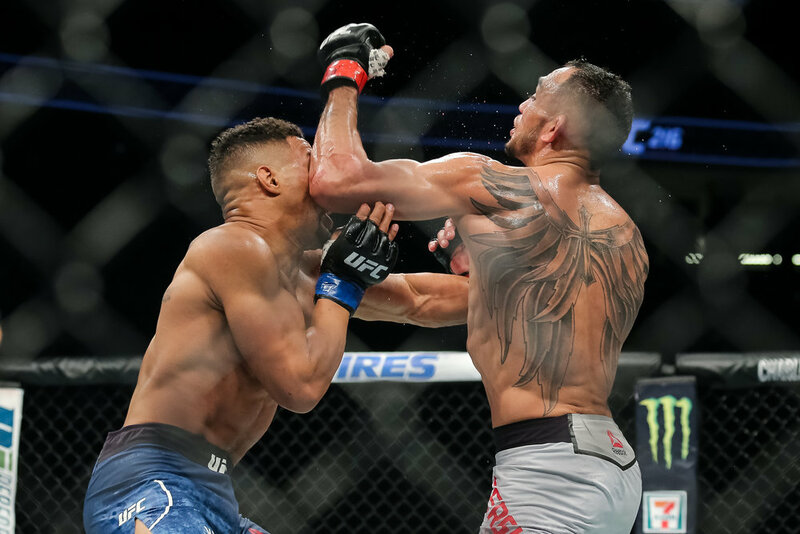 Tony Ferguson lands a big elbow against Kevin Lee, on his way to becoming the interim UFC lightweight champion. Michael Johnson training at the UFC Performance Institute, just days before his epic FOTY candidate with Justin Gaethje. Up close action on the glass from the Golden Knights v Maple Leafs game. The Golden Knights have been the surprise team of the NHL season. Yuri Villefort retains his VFC welterweight title and celebrates with Cash Halverson. Portrait of UFC star Cody Garbrandt, backstage at the World MMA Awards. Portrait of the UFC heavyweight champion, Stipe Miocic, taken in his hotel room before his UFC 220 press conference in Las Vegas, NV. An emotional Tim Elliott takes a moment to reflect on his victory. 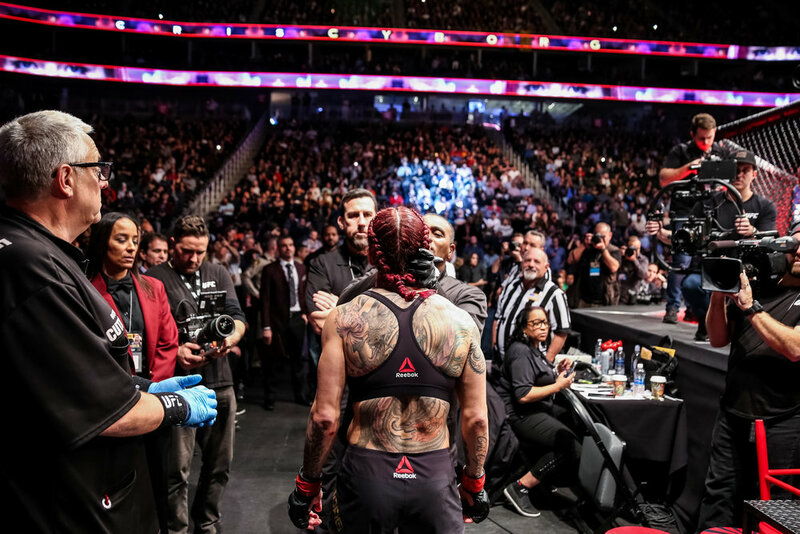 The final UFC event of 2017 gave us Cris Cyborg defeating Holly Holm to retain her featherweight title and solidify herself as the baddest woman on the planet. The Eagle spreads his wings. Khabib Nurmagomedov just moments before entering the cage against Edson Barboza and showing the world why he believes he is the best lightweight on the planet.